Once administered, the opioid-blocking effects of VIVITROL are expected to last approximately 28 days. In an emergency situation, reversal of the VIVITROL blockade may be required for pain management. Please review the safety information for When Reversal of VIVITROL Blockade is Required for Pain Management. See section 5.6 of the VIVITROL Prescribing Information. 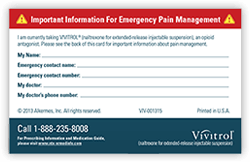 In an emergency situation in patients receiving VIVITROL, suggestions for pain management include regional analgesia or use of non-opioid analgesics. Irrespective of the drug chosen to reverse the VIVITROL blockade, the patient should be closely monitored by appropriately trained personnel in a setting equipped and staffed for cardiopulmonary resuscitation. Patients should carry written information with them at all times to alert healthcare providers that they are taking VIVITROL, so they can be treated properly in an emergency. 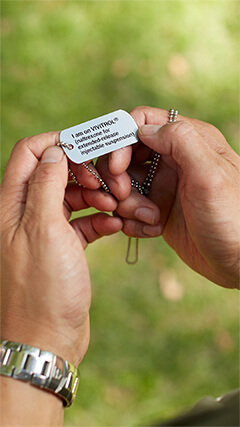 A VIVITROL pain management card, medical alert bracelet, or medical alert dog tags can be ordered by calling 1-800-VIVITROL (1-800-848-4876), option #1.